Pediatric therapy is valuable to children who are not meeting age-appropriate, developmental milestones. 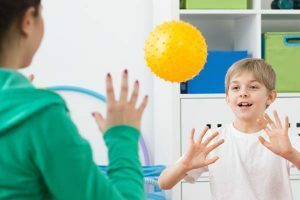 Therapists are trained to understand how children develop and can train caregivers and family members to address developmental delays in the home. It is always challenging to determine if a child needs therapy. A parent or guardian may get a suggestion or hear concerns from a teacher or day care professional about their child not being able to perform a specific skill. Pediatricians frequently recommend therapy services. Sometimes, a parent may observe their child having difficulty with a skill that other same-age children have no difficulty performing (an example may be: walking, talking, swinging from a swing or writing their name). Other circumstances that may lead parents to seek out therapy include when a child is adopted from a foreign country, born with a syndrome, or is born premature. In these situations, it is always best to learn about typical development and discuss the development of your child with a pediatrician. Therapy sessions can depend on the age of the child. When working with a child, the therapist addresses specific goals catered to your child’s needs. Therapy sessions are carefully disguised as play. Children pick what they want to do in treatment and the therapist carefully caters their goals around what motivates the child. Treatments are often as fun for the therapist as they are for the kids! Children who come to Building Blocks Pediatrics are motivated because they feel effective, proud and they have FUN! Parents are motivated because they see their child improving on specific skills and they too are learning how to carry therapy sessions over to the home. Are the therapists licensed and insured? All of our therapists at Building Blocks Pediatrics, LLC, carry malpractice insurance. All of our therapists are licensed through the state of Georgia. Insurance Coverage Coverage of insurance is dependent on your specific insurance plan and code provided by your physician. At Building Blocks Pediatrics LLC, we have a professional billing department that will bill certain insurance plans, and invoice parents. Many insurance plans will cover a limited amount of therapy services. A physician’s prescription and diagnosis code is required by insurance companies and the state of Georgia. You are Ultimately Responsible Please be advised, you are ultimately responsible for payment of all services received. All families are advised to fully know and understand your insurance benefits prior to your child receiving therapy services. All insurance plans are different and it is impossible for Building Blocks Pediatrics, LLC, to know the specifics of your plan and/or if your plan will reimburse for services received. Regardless of insurance verification or anticipated insurance coverage. You are ultimately responsible to pay all fees accrued for services. Building Blocks Pediatrics is currently in network with Blue Cross Blue Shield, Cigna, Georgia Medicaid, Peachstate, Amerigroup and the Katie Beckett Deeming Waiver. BBP Cancellation Policy When a patient is scheduled for an appointment for therapy, we set aside the time and professional resources needed to meet the needs of that patient. When a patient fails to show up or cancel the appointment with at least 24 hours notice, professional skills that could be used to help other patients, go unused. While we understand that it is occasionally necessary to cancel an appointment due to an unexpected event or scheduling conflict, it is our policy that when a patient misses two consecutive appointments or falls below 75% in recent attendance, to remove that patient from the schedule. That appointment time will be made available to the next patient on our waiting list. At Building Blocks Pediatrics, we believe that success begins with consistency of treatment. 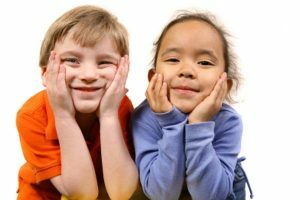 If you find that your child is unable to consistently attend sessions in their allotted appointment times, you will need to call our office to see if there is a more suitable time slot available. Otherwise your child will be removed from the schedule until there is an opening more convenient for you.